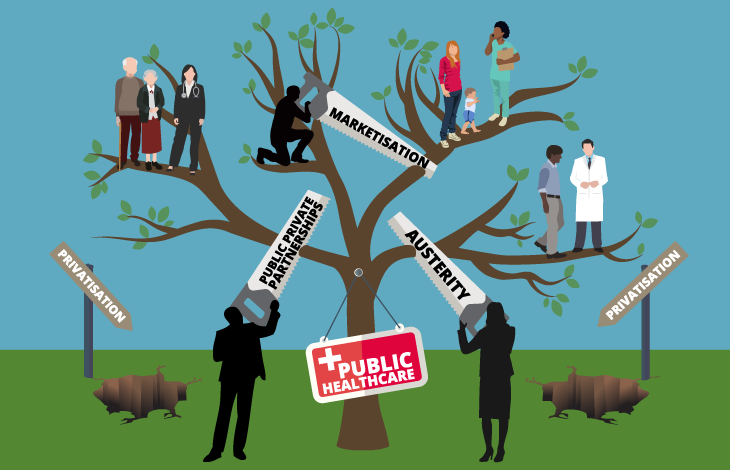 What Does Government's Neo-liberal Agenda Have in Store for the NHS on its 70th Anniversary? in Store for the NHS on its 70th Anniversary? In the run up to the 70th anniversary of the NHS on July 5 this year, Theresa May announced before Easter that she pledged to bring forward a long-term funding plan for the NHS in response to growing concerns that key health services are being overwhelmed by rising demand. She said, "This year and in advance of next year's spending review I do want to come forward with a long-term plan. I want that to be done in conjunction with NHS leaders and provide a multiyear funding settlement consistent with our fiscal rules and balanced approach." Health Secretary Jeremy Hunt has appealed to his colleagues for ideas, promising in a letter to all Tory MPs that solutions for the NHS and proposals on social care will be settled by the summer. It was expected his Green Paper would appear before the summer, "to jump-start debate" on where future social care funding should come from. Ahead of this Green Paper, the House of Commons Communities and Local Government Committee and the Health Committee have been taking evidence on the long-term funding of adult social care. The scope of this short inquiry is said to be "to identify funding reforms which will command broad consensus". As an indication of where this is leading, Simon Stevens, Chief Executive of NHS England, told the inquiry on April 24 that in his view the homes of pensioners' should be used to fund social care rather than any major tax rises on those of working age. It is significant that these are presented as the two alternatives. Simon Stevens cast his proposal in terms of "fairness", indicating that pensioners' homes should not be sold until after their death to recoup the costs of social care, thus attempting to distance the proposal from that of Theresa May for a so-called "dementia tax" in her ill-fated election manifesto. Simon Stevens put it this way to the inquiry: "I think there are big questions about intergenerational fairness and what the right way to raise resources is, given the relatively advantaged position of my parents' generation relative to my children's generation." He suggested that any "sustainable" solution would make use of an alleged £1.5 trillion "accumulated housing wealth". In addition, it was reported that a cross-party group of MPs including former ministers, is again urging the government to convert National Insurance into a specific tax for the NHS. Following this it was said that the Health Secretary is reported to be be open to the idea of a specific tax for the NHS. The reports have also said there is a "cross party back-bench revolution" linked to whether a new "centre party may emerge". MPs who are loyal to Jeremy Corbyn have distanced themselves from any cross party consensus and Corbyn himself has maintained that health care is a right in a modern society. One thing which is certain is that these speculative announcements, whether for bigger financial commitment to the NHS or a "cross party consensus" on how the NHS and social care should be funded, are all being driven by the government's neo-liberal agenda in health with no guarantees that the right to health care will be guaranteed and even maintained free at the point of use. Under present arrangements health authorities are no longer responsible for the health care of the population, nationally, regionally and locally. Councils are no longer able to fund social care out of their decimated budgets. The response of government is to dictate further the transformation of the health and social care services into a corporate-led system. The present system poses as a GP-led system set up under the government's chief commissioner NHS England with its network of clinical commissioners (CCGs). It is being further transformed with newly proposed "Integrated Care Systems", previously called "Sustainability and Transformation Plans" (STPs). For example, the Health Service Journal reported last month that Northumberland, Tyne & Wear and North Durham; Darlington, Teesside, Hambleton, Richmondshire and Whitby; and West, North and East Cumbria were in talks to become an integrated care system by April 2019. It would cover a population of 3.2 million. The rationale is supposedly to "make difficult decisions" about and provide a "mechanism for managing financial risk" over a vast area of the northern region and part of north Yorkshire. Such organisations are being set up, not to plan and take up responsibility for health and social care services to meet the needs of local populations, but to manage the health market in the interests of competing public and private corporate organisations and to dictate the rationing of these services far away from any control by local populations. This puts aside any responsibility to actually provide and guarantee access to acute, community, mental health and social care services for every region and locality. This agenda which under present arrangements is already reducing safe access to vital health services for whole swathes of the population in England is being further pursued in the present deconstruction of local District Hospital acute services and the local GP services across England. This is the "long-term plan" to switch funding into a community service that is intended to be predominately dominated by the private sector companies leaving acute services mainly provided by public Trusts chronically underfunded and forced to compete with each other for funds and clinical staff in order to provide acute, community and mental health services. 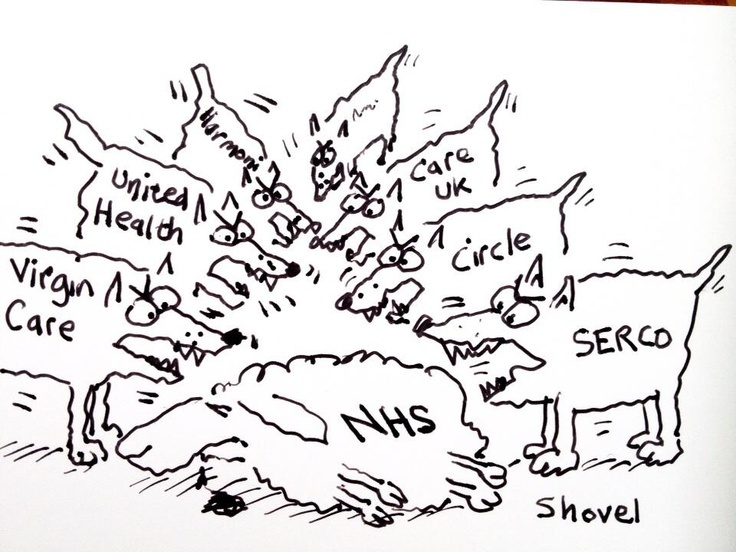 This is what is behind the increasing crisis in the NHS which is being compounded by hospital service takeovers and downgrading of services, adding to loss of acute services and thousands of much needed beds in many local hospitals. It is also behind increasing contracts given to private companies to manage GP and community services, hospital admissions and private online GP services that will de-register more and more patients and funding from the local GP system restricting further access to local GPs. What has to be emphasised as we approach this 70th anniversary of the NHS is that society has to have a plan that recognises that health care is a right and that right must be guaranteed by government. The NHS is a vital part of the socialised economy, that needs to operate at the highest level in preventing illness, providing health care and when needed immediate emergency care, to the whole population and cannot be subject to the vagaries of any corporate neo-liberal profit making agenda. Also, health as a right cannot be planned on the basis of excluding people by any form of insurance payment whether public, or private. Health care is the claim of all on the economy, on the value that is added to society by the working class and people. Health workers provide vital and accessible health services to all and in doing so create value in the socialised economy by curing people when sick and injured and keeping healthy the human resources of society and all those who live and work in it. This new value is consumed by big corporations in contracting to employ the labour power of a healthy workforce. This is value which should not simply be expropriated by them but should be claimed by the government as value that can then be used to fund the NHS as it should be. In preparing for the 70th anniversary of the NHS, health workers and the people as a whole as they fight in every part of the country to safeguard the future of the NHS need to discuss how to build this fight for a new NHS. Such an NHS must at the very least not exist as a pay-the-rich enterprise, and must meet the claims of all for health care as of right. 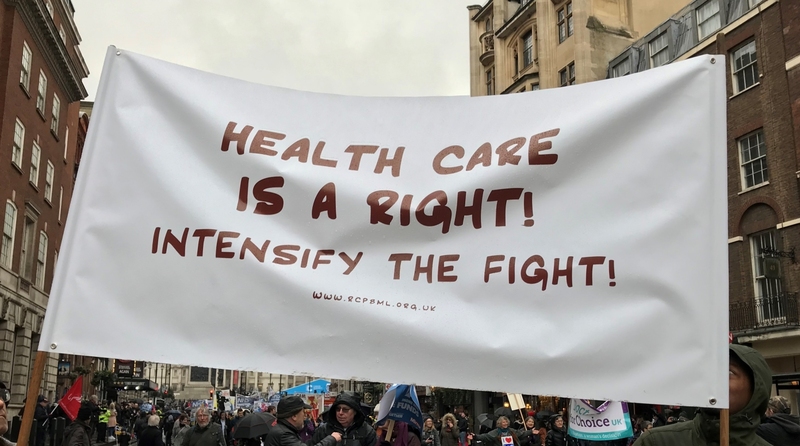 Ultimately, to fight for the right to health care to be guaranteed it must be recognised that the decision-making power of the working people is required over society and its economy.